I just saw word today that Nicholas Courtney, the actor who played "The Brigadier" Alistair Gordon Lethbridge-Stewart alongside five different Doctors from 1968 to 1989, died yesterday at 81. A truly great actor beloved by many Doctor Who fans. That's another one of the links to the early years of the show gone now. The actors who played the first three doctors are all of course dead as well. The Brigadier popped up a short while ago in the spin of series, 'The Sarah Jane Adventure's', which is mainly aimed at teenagers. That will obviously be his swansong and they will probably find a way to write him out on-screen by a reference at some future point. That's too bad. I just finished watching "The Three Doctors" = what jolly fun. just found out today that Elizabeth Sladen (Sarah Jane) died earlier this week. She and Tom Baker were my introduction to Doctor Who. May her memory be eternal. Very sad news. Memory eternal. Wow! Elisabeth Sladen was one of my favorite Doctor Who stars. Her character, Sarah Jane Smith, ranks right up there with Tegan Jovanka (the self-proclaimed mouth with legs) as among the traveling companions I remember most. I was particularly happy to see Elisabeth come back and reprise her role as Sarah Jane in a few of the Tennant episodes. May the memory of the handmaid of God, Elisabeth, be eternal! I had not heard this...thank you for letting us know. Peter are you familiar with the kids spin of show 'The Sarah Jane Adventures' she starred in. Which oddly enough she had recently left before her death. The new Doctor Who series started here last night and there was a dedication for Elizabeth Sladen inserted at the start of the show. Very sad news but considering how the show has aired for nearly 50 years now in some form or other I supposed we shouldn't be surprised when actors and others associated with earlier periods of the show are suddenly no longer with us. Still considering she was only 63 and looked fabulous for that age it was unexpected. I still haven't seen the Sarah Jane Adventures, but I'll look for the DVDs. Which makes Tom Baker's longevity even more remarkable. Of course, should that be a surprise? No man ever played the lead role longer than he did. Funny enough my wife has become a fan of Dr.Who in the last few years. But the one Doctor she cannot stand is the Fourth Doctor, she prefers William Hartnell, Patrick Troughton, David Tennant or the current incumbent Matt Smith. She'd never heard of the show till she came to the UK a few years ago but something about Tom Baker seems to irk her. I suppose you can't win 'em all. This just in: David Tennant, the actor who recently finished playing the role of the Tenth Doctor, just married the daughter of Peter Davison, the man who played Doctor No. 5 (coincidentally or not, Tennant's favorite Doctor from the classic series). Irony of ironies, Tennant and his new wife, Georgia Moffett, met on the set of the 2008 Doctor Who episode, "The Doctor's Daughter". Where she played the episode's title role. So, the Doctor has married the Doctor's Daughter- I didn't know Time Lord's were such strict adherents to Freud. Well, it wouldn't be the first time the actor playing the Doctor married one of his co-stars. Remember Tom Baker's brief marriage to Lalla Ward (Romana No. 2)? Question: have there ever been any Dr. Who video games? And BBC has a few starring the voices of the current actors on their website. Free for those in the UK, cash-money for us Yanks. Yeah, but it IS the first time that the actual daughter of a Doctor has co-starred as the Doctor's daughter, only to marry the Doctor who played her daddy. But, hey, sometimes a cigar is just a cigar. I haven't been following continuity stuff too well... has the new series said anything about the Doctor's grand-daughter Susan? IIRC just a few vague references to the fact that he had a family. It just seemed odd to me that such a big deal was being made that the Doctor had procreated, when everyone should have known from the beginning of the show that he had a granddaughter. The producers (especially of the Matt Smith series) have had an odd resistance to going into the past continuity- they missed out on the Doctor's Daughter episode tying into the whole grand-daughter thing, there was an episode of the 11th Doctor where they could have addressed the Valeyard (who is, I believe, due at some point soon). They love bringing up the classic monsters (though, again, less of that the past two seasons), but shy away from the Time Lord mythology, aside from the teasers we got from the Eccleston-Tennant years (to this day I would still love to hear more about that last Time War, and I'm still wondering who the woman in the Tennant finale was- Doctor's mother or Romana?). Some of this is understandable, it seems that the mythology started getting really weird during the McCoy era (especially in the books). About the only thing we know for sure about the continuity in the past seasons is that the Doctor stole the TARDIS. What does everyone think of the Dr. Who Christmas Special that was on TV this year? I have been watching Season 6 on DVD too. Where it really counts, they carried on the worst aspects of the original series, especially in the 80's, where the Doctor became a godlike being, almost an eternal principle, at the center of everything. And the Daleks and Cybermen really should be retired... their earlier stories were great but now they're stock monsters. I think these past two seasons have gone a good way toward correcting that perception- the Doctor is still a powerful, almost elemental, force for good, but there has been less of the "Oncoming Storm" sense of that awful, invincible good and more of a focus on the "mad man with a box", fallible, prone to mistakes, and the companions existing as much to provide help as counter-balance his ego. I agree with you: especially in regards the role of Amy Pond "helping" him. Any thoughts on Jenna-Louise Coleman joining the show? Was there a Doctor Who "Christmas Special" this year that I missed? There was, and a brilliant one it was too! With Richard E. Grant as the (human) antagonist, and the return of the Great Intelligence! I haven't bothered with the new series in about a year, it's just so irredeemably bad. I wouldn't call it irredeemably bad, although for purists whose calendars stopped with Tom Baker, it may certainly appear so. :-) I like the greater-story-arc treatment, and certainly Karen Gillan and Arthur Darvill were among the best companions ever. J-Lou already looks promising, as well. I agree with you (and I grew up with Tom Baker, too). The only period where I would have described Doctor Who as irredeemably bad was while Sylvester McCoy was the Doctor. Matt Smith's good, a reasonably close third behind Tom Baker and David Tennant, in my opinion and the Ponds were excellent companions. The Christmas special was well worth watching (almost the only good television over the whole Christmas period that I can recall) and I'm looking forward to more. Nothing better than sitting down to watch Doctor Who with the kids on a Saturday evening. The worst thing about the McCoy years was the virtual deification of the Doctor, and that has continued in the new series in spades. Once you've made him the center of the universe, it's very hard to go back to him being some random, eccentric meddler who occasionally shows up. 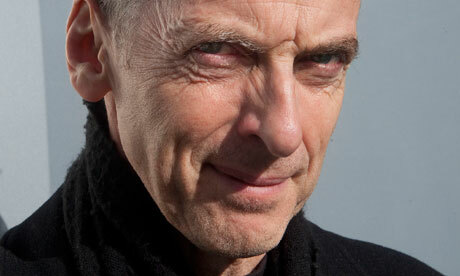 So, now that we know that Peter Capaldi is going to be Twelfth, are there sighs of relief or groans around? Well, it's an older dude (same age as Hartnell when he started), so maybe lame love-interests will fall by the wayside and the writing will improve. I don't have much hope for it though. I'd say Smith was my favorite Doctor, even if the actual stories the Eleventh got into weren't as good as they could've been. Tom Baker is a second, and then David Tennant. I honestly look forward to the day when we have a new showrunner. Moffat was great at individual episodes but not so great at running the whole show, in my opinion. I think it was his hand that held this last Doctor back from being the best one so far. I have pretty high hopes for the new Doctor, though they'd be higher if we had someone else at the helm of the actual plot. "Victory of the Daleks," the worst Dalek story in the history of Doctor Who- and that's saying something- happened under Moffat's watch. I heard today that Peter Jackson may direct an episode of Doctor Who in the not-too-distant future. Apparently, he's always wanted to, but has been too busy recently producing and directing The Hobbit trilogy.